VINE is a free, anonymous, 24-hour, computer-based telephone service provided by the State of Nevada. VINE allows victims of crime two important features: information and notification. Call 1-888-2NV-VINE (1-888-268-8463) and follow the prompts. VINE will quickly tell the caller if the inmate is still in custody. Victims may call VINE from any touch-tone phone, any time, to check on an inmate's status. Callers may then choose to register for an automated notification call when an inmate is released, transferred, or in the unlikely event that the inmate escapes. To register, callers simply enter the phone number, including area code, where they want to be reached. Callers will then be asked to choose and enter a 4-digit Personal Identification Number (PIN) for use during notification. The service will automatically call when the inmate is released, transferred, or escapes. Do not depend solely on the VINE service for your protection. If you feel that you may be at risk, take precautions as if the inmate has already been released. 1. Obtain an Order for Protection. 2. Know your surroundings and escape routes. 3. Tell employer, friends, and family of the circumstances so they are aware of any danger. 4. Use code words with children. 5. Inform school administrators for your child's safety as well as yours. 6. Change your pattern. Don't do the same thing the same day at the same time. 7. Consider an alarm system for your home. 8. If you have a cell phone, keep it with you at all times. 9. Keep your vehicle fuel tank full at all times. The Detective Division and the Domestic Violence Unit provide quality investigative services to the citizens of Washoe County . 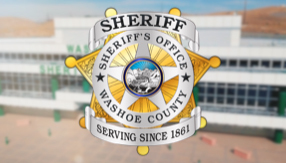 The Washoe County Sheriff's Office also contracts to provide needed services to victims of crimes such as sexual assault, domestic battery, harassment, homicide victim families, and violation of extended and temporary orders for protection.